Breathers, A Zombie’s Lament – Book Review | We Zombie! 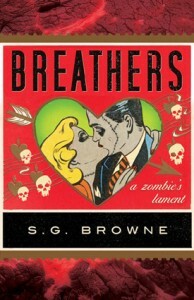 This book, from S.G. Browne, (soon to be a movie) is a little bit romance, a little bit Romeo and Juliet, and a lot Zombie. Who knew that zombies could have romantic alliances and who knew that I would care!! Truly, I found myself cheering for Andy and Rita, hoping that their relationship would blossom and that they could settle down with a house in the suburbs, a white picket fence and 2.5 little zombies…. Andy, a recent zombie, is living (hiding out) in his parents’ basement. He has all of those annoying little issues that plague zombies and makes their life so difficult and impossible to blend in with “breathers”: He can’t talk, he lurches and there is that annoying little problem of the stench of decay. His parents, surprisingly enough, are not pleased that he has returned from the grave. Dad is perpetually angry and mom tries to be oh so supportive but really can’t stand to touch him. Most of his days and nights are spent drinking bottles from dad’s expensive wine collection and watching what passes for entertainment on the telly. The only bright spot is his support group, Undead Anonymous. At Undead Anonymous, Andy and his fellow zombies with their incredibly positive leader Helen, discuss their situation and how to cope. Helen encourages the zombies with catchy little quotes like, “Hope is not a four letter word!” In spite of all these inspirational messages, the zombies barely manage to amble and shuffle through life. However, life for the Undead Anonymous attendees changes dramatically when they befriend a rogue zombie. After dining with Ray, the zombies start to undergo some physical alterations. Their pre-zombie wounds heal, walking and speaking improves, and hearts begin beating (and romance is the air –much easier on the nose than formaldehyde). The psychological and emotional changes are even more pronounced. Our hero, Andy, no longer content to lurk in the basement, begins to appear in public. Sadly, many of his escapades end with being picked up by the SPCA, but at least he is going for the gusto, seizing the day, grabbing life by the …. As they say, things fall apart, but not before life gets very good for the zombies. I’ll leave the ending for future readers to discover. Suffice it to say that your sympathies will be with the undead. I highly recommend this zombie love story for zombie aficionados and romantic fools alike. It is a romantic twist on life as an undead in a world of breathers.